India. Yaudheya Republic. Copper unit, ca. 3rd century AD. Size : 24.0 x 24.5 mm. Weight : 10.96 grams. Reference : Mitchiner Ancient - 4711-4715. 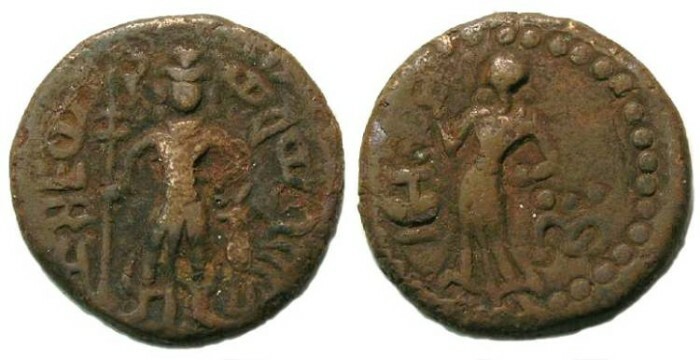 Obverse : Kartitkeya standing forward holding a sceptre, with a peacock at his feet to the right, with a inscriptions that translates to YAUDHEYA GANASYA JAYA DVI around. Reverse : Female deity standing slightly left with one hand on her hip, lotus and nandipada symbols in the fields, and her feet on the dots.